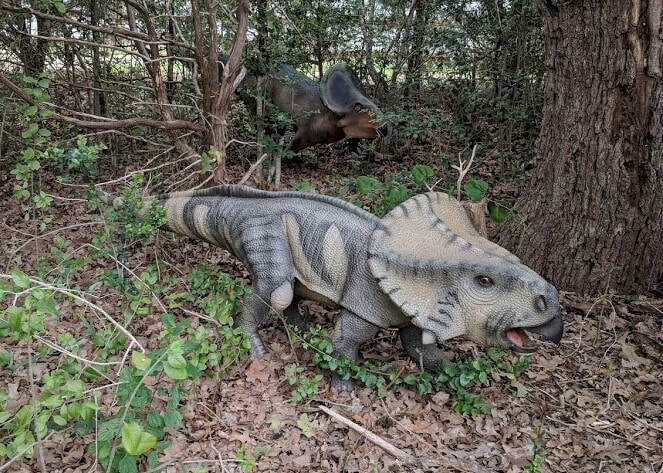 This is the first ancestor of the famous ceratopsian family to look like the later, more famous members such as Triceratops. It was much smaller that its more famous relatives, but it was a very successful dinosaur that lasted many millions of years. Protoceratops didn't have horns to protect itself, just its sharp beak to bite with. Like other ceratopsians, it probably lived in slow-moving herds. Many fossils have been found from this particular type of dinosaur. Protoceratops is one of the few dinosaurs for which a complete growth history can be seen in fossils ranging from infant to adult. Like other ceratopsian family members each individual shows a difference in the size and shape of its frill. Protoceratops frills were not solid and did not grow overly large. Some scientists believe that the frills may have been brightly colored for display, either to intimidate attackers or for courtship. One of the most famous fossils ever found is of a Velociraptor and a Protoceratops locked in battle. They were both killed instantly, probably overtaken by a sandstorm, in the midst of a fight.